Give a guy a face wash and he’ll more than likely make a quick judgment based on how it lathers. If it produces visible foam, it must be doing something right. 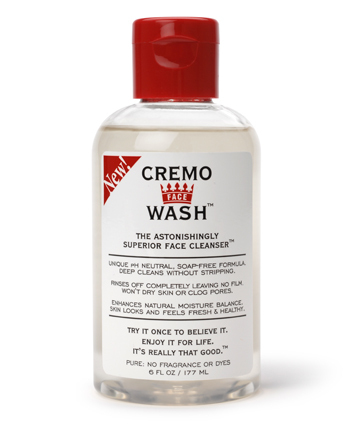 That was the quick and simple judgment I made when I tried Cremo Cream’s Face Wash. Using an amount equal to the size of a dime, I worked up a great lather and I was sold. After I tried it a few times, however, I noticed how my face felt and its appeal grew on me even more. I realized, how light its application is and it rinses off leaving my face feeling fresh and hydrated. That simplicity carries itself over into the packaging, a clear bottle and red top. Don’t let that fool you though. While the ingredients are listing on the bottle, they go more into depth on their site. I can appreciate that and I think you will too. This entry was posted in Grooming, Product review and tagged Cremo Cream, Face Wash, Men's grooming, mens grooming products, shaving supplies. Bookmark the permalink. Sounds simple enough – will have to give this a try.